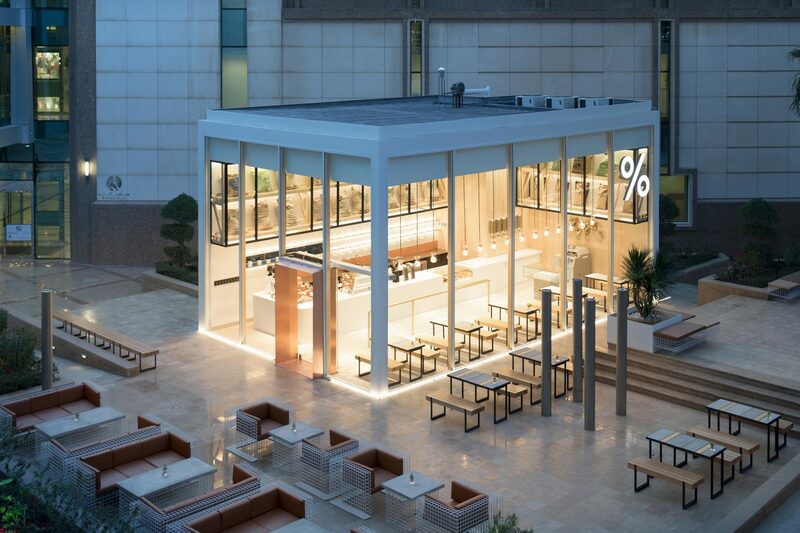 The coffee shop was built in an open space on the ground floor of a previously completed high-rise complex, adjacent to a shopping mall, a bank and parking. It was built as a glass box with the maximum allowed floor area of 73m2. More space was available for outside seating. Both the coffee shop and its terrace are on the same level as the surrounding plaza. The café is dedicated to upholding the highest standards of the coffee-drinking connoisseur. Its simple rectangular form was part of the concept from the very beginning; a stage-like presentation of the world of coffee behind the long counter. The purely functional display of coffee grinders, roasting machines, espresso machines and sacks of fresh coffee beans forms the background to a ceremony devoted exclusively to the preparation of coffee. 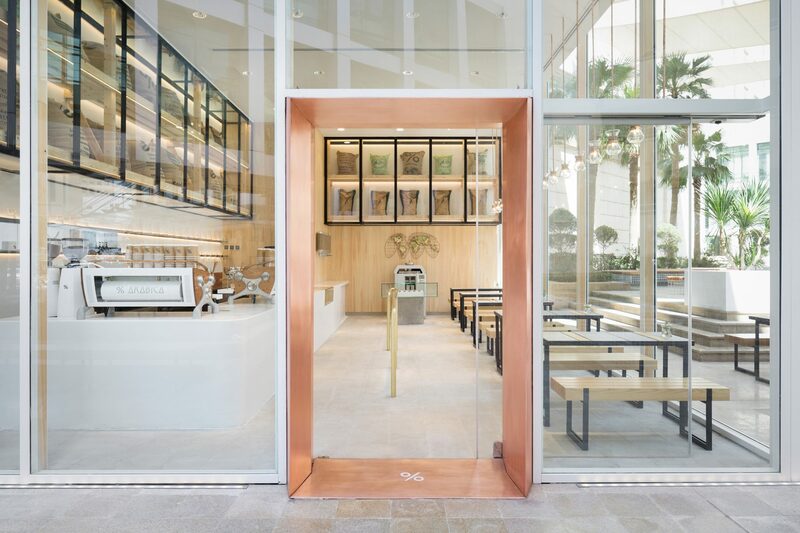 The interior design is characterized by a low-key combination of simple raw materials combined with exotic Hinoki-wood and copper highlights in contrast to the main steel and glass construction. The glass façade provides a borderless spatial transition between the interior and the outside terrace. As the name Jardin suggests, the flowerbeds and shrubbery of the terrace provide a relaxing green oasis between the surrounding towers. Since it rarely rains, there was no need to compromise in the choice of materials for the seating and tables: they are realized in Hinoki-wood and luxurious leather. The terrace is shaded by stretched overhead awnings to protect against the direct glare of the sun. 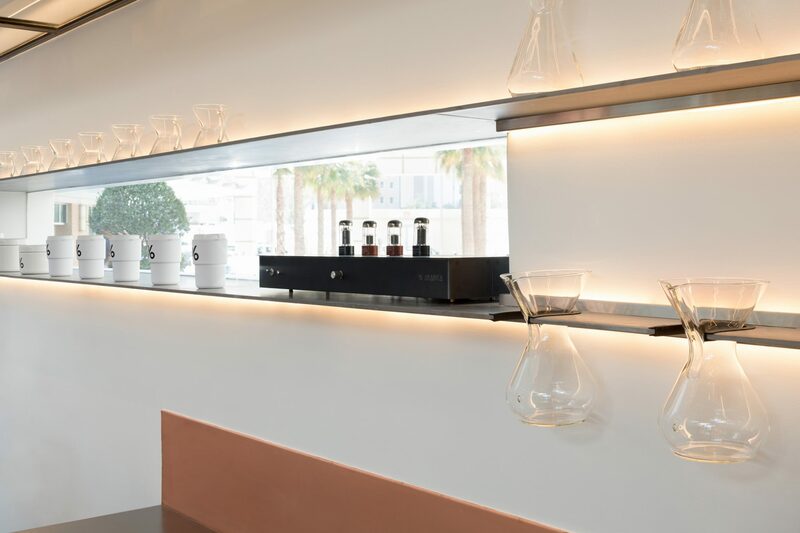 In Kuwait people drink coffee until well after midnight and the transparent glass box, with its warm and welcoming lighting, encourages potential customers to enter when the temperature falls in the evenings. This is the second franchise of the Kyoto-based %ARABICA company to be established in Kuwait. 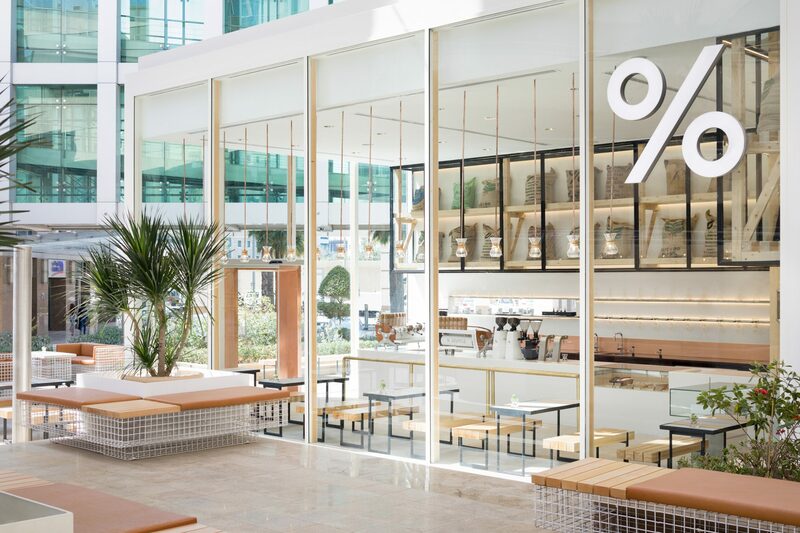 Here, as elsewhere in the world, the clean-and-lean brand image cultivated by %ARABICA is an expression of their slogan: See the world through coffee. They provide a meeting point for those who appreciate fine design and perfectly served coffee.